How many of you have collections of the different woods you’ve worked with? I’m hoping to assemble enough samples to have to build a box for them one day. 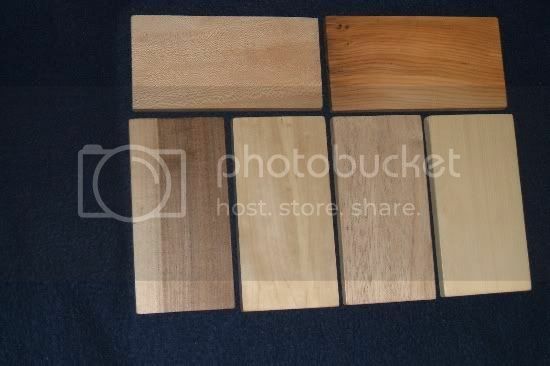 Here’s a photo of Sycamore, Yew, Walnut, Birch, African Mahogany and Yellow Cedar. This is a good idea. I should gather up cutoffs from my work so I can identify wood easier. (Oh wait, I STANRT with cut-offs) haha Still a good idea. 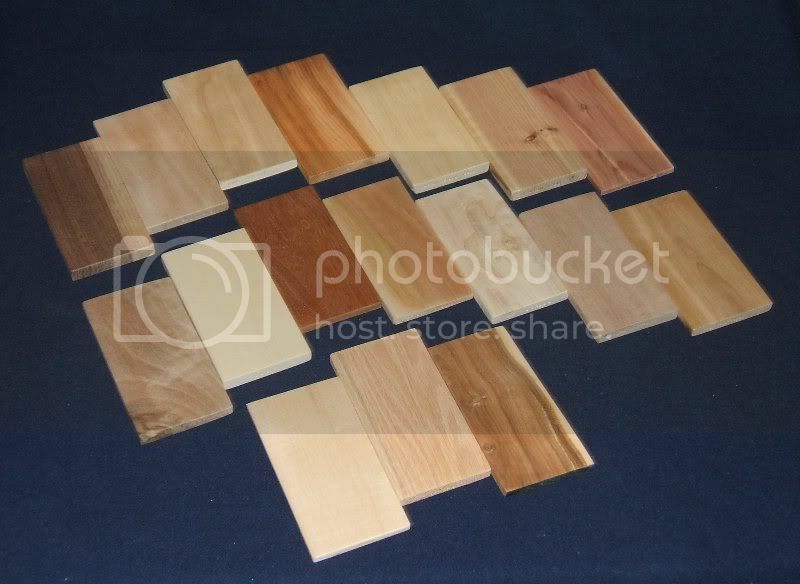 Gary posted a project of the box that he made to collect his wood samples. A great project to keep them around. I probably have about 20 different species around in my shop. Thats a cool idea I’ve been working on a slightly different version, i turn wooden spheres (I don’t call them balls because it makes my wife giggle when she asks me what I’m wasting my time working on now and I say I’m making a set of (you get the idea)) The main difference is I finish the sphere with different finishes so that my customers can see what their project will look like. I need to post a some pics of the different combinations. yes, please do! I’d like to see how others are presenting their samples. You’re cutting me pieces? Yes, yes, please! What can I do for you? Looking like a great collection. Mine consist of about 5 species? ? ?? Now lets see what you can make with them. ;-) ..all those little samples? Maybe a house of cards. No, I know what you mean. One of my biggest woodworking failings is continuing to make projects for my shop, or side projects like this collections one, and not producing useful items. I really must exert some self-discipline and tackle something new and worthwhile! Excellent idea! Not just as a wood reference, but for all the memories of what you built. It puts a new meaning to the word scrapbook. This looks like I could do on days I want to be in the shop, but don’t feel up to working on a project. You may want to become a member of the International Wood Collector’s Society www.woodcollectors.org, as they are a wonderful resource of information and have members of all ages, interest, backgrounds and have a publication and meetings all over the globe, many in the USA. Also, since you are in Washington State, you have access to some beautiful woods such as Black Walnut (Claro Black Walnut), big leaf maples (quilted & figured), Madrone/Madrone Burl, Manzanita, etc.. I knew of the Wood Collector’s Society, thanks for mentioning it. I’ll probably just keep adding to my collection as things come across my path. A fellow LJer, Autumn, is in my home town and is a resource of exotic woods all by herself, lucky for me. It’s funny, but once people hear I am doing this, friends say “I just took down a willow, do you want a piece?” and are anxious to expand my few pieces, which is nice. WA state is rich in woods, but they are pricey to acquire here, east of the Cascade Mtns. However, I am very rich in local fruit woods, and have access to apple, cherry, apricot, peach, plum, etc. Plum is some beautiful wood, though drying degrade is high. A friend visited to load up some of my silver maple and saw the plum tree in the back yard, offering to help take it down in exchange for some of the wood. I’m still cogitating on that whole-lotta-work, but will do it eventually.